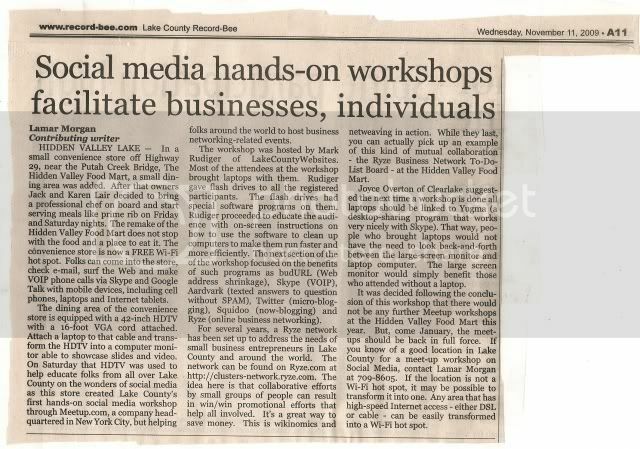 Write a press release about your business and submit it to the local newspaper.� These days newspaper are shrinking. Reporters are disappearing due to the lack of advertisers. Therefore, this presents you wlth an opportunity to be the citizen journalist.� Just make sure that what you write about is newsworthy and not an ad.� When you can spread your business message as a newsworthy item, I believe you are going to automatically garner more attention. Below is a press release I submitted to the local newspaper. They turned it into a news story and even gave me a by-line.� Please keep in mind that I am not an employee of the newspaper. And, if I can do it, perhaps you can as well.